The Krohn-Hite Model 3900 programmable, dual channel Elliptical filter/voltage gain amplifier is one of a family of new programmable filters from Krohn-Hite. It was carefully designed with the user in mind, providing ease of operation, reliability and price competitiveness. All backed with the quality which Krohn-Hite has provided in filters since 1949. As an elliptical filter, the Model 3900 has two independent filter channels that have a tunable cutoff frequency range from 1Hz to 99kHz and a rolloff rate of 115dB/octave. Each filter section has a minimum stopband attenuation of >80dB and a passband ripple of typically 0.22dB. The 3900 provides either a single-ended or differential input with a common mode rejection of >60dB. Input gains up to 40dB in 10dB steps and output gains to 20dB are also provided. The 3900 will accept input signals of ±10V peak at 0dB gain and has selectable ac or dc coupling. The filter is GPIB Bus programmable and is complimented with non-volatile memory for the storage of up to 99 front panel set-ups. 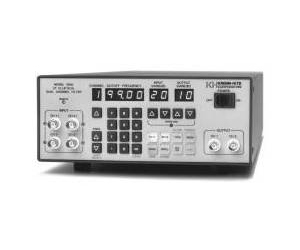 Overload detectors are standard and assist the user in detecting excessive input signals or incorrect gain settings. The 3900 is also a programmable voltage gain amplifier for applications that require a low noise amplifier. The amplifier has a bandwidth of 1MHz and gains to 60dB, selectable in 10dB steps, and a wideband noise of <100µV.